This is the Official HorrorConUK 2018 Guest Poster by Genre Artist Graham Humphreys - Order now to reserve your Limited Edition, signed, poster for you to collect at HorrorConUK on the 19th or 20th of May 2018. 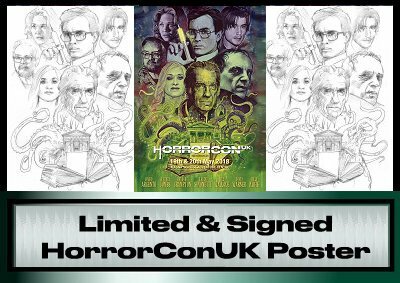 Exclusive HorrorConUK poster, featuring 2018 guests (Dario Argento, Jeffrey Combs, Barbara Crampton, Dee Wallace, David Warner, Claudio Simonetti, David Warner & Billy Wirth by genre artist Graham Humphreys. Please check our our full Terms & Conditions if you require more information about our tickets.